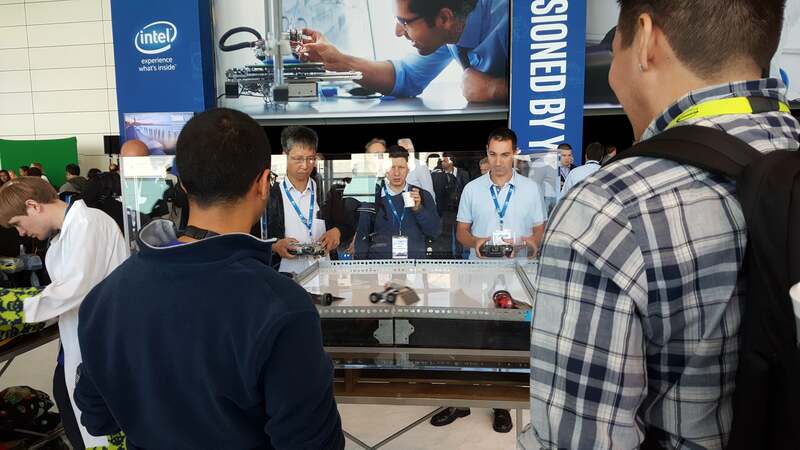 Every year at the Intel Developer Forum Intel and its partners showcase the latest technology with some outstanding exhibits. These are the best of what we found. Why buy toys when you can scan them? Each year, Intel holds its Developer Forum to lead the PC industry into the direction Intel wants it to go: powerful new PCs, connected devices, touchscreens, and the like. Well, a bunch of stale PowerPoint foils won’t do the job. 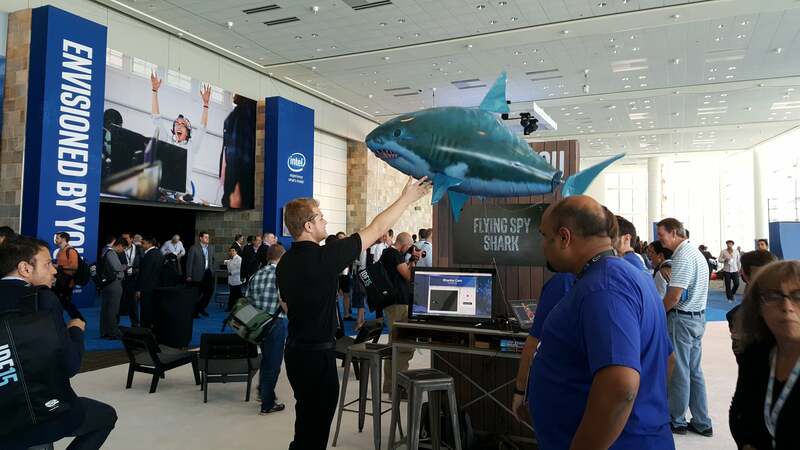 So Intel and its partners seed IDF with some amazing, awe-inspiring demos, all in a bid to get the developer community behind this year’s technological focus. What sort of demos, you ask? We have some of the best in the following pages. This little beauty graced Intel chief executive Brian Krzanich’s keynote, along with its smaller cousins right behind it. 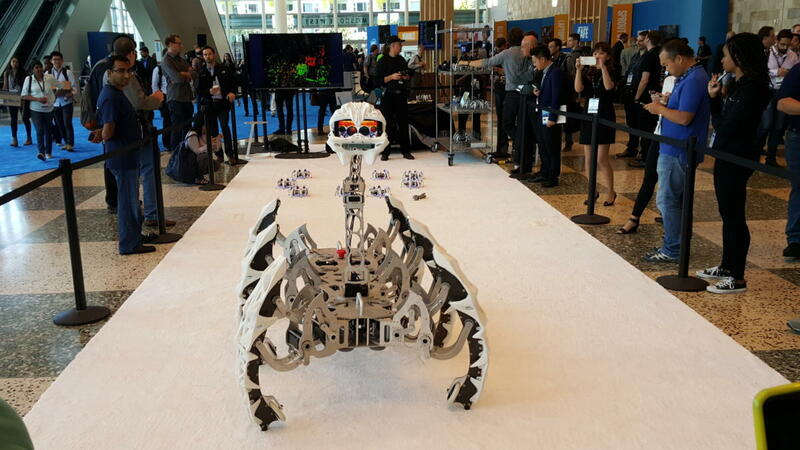 Intel believes its future is in the Internet of Things, and this spider robot is powered by embedded Intel chips. 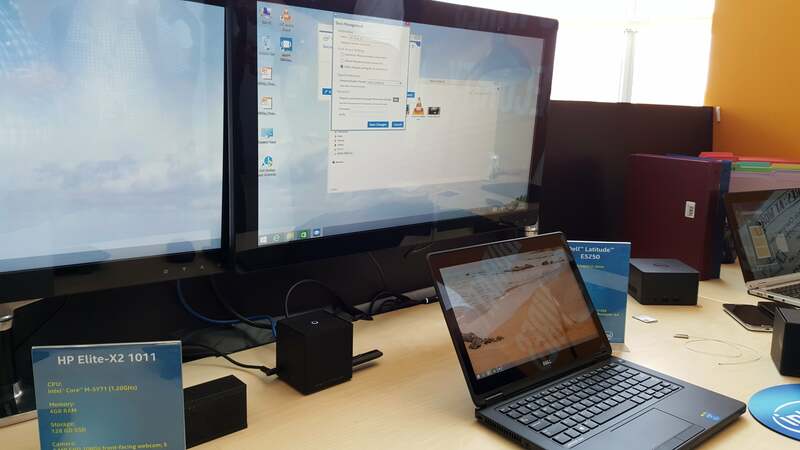 Part of Intel’s Skylake vision is a “wire-free” PC: connected by Wi-Fi, charged by Rezence wireless charging, with images sent to a monitor either by WiGig or WiDi. What’s the difference? What can WiGig do that WiDi can’t? In Intel’s world, WiDi is designed for the living room, while WiGig is a high-bandwidth connection for your office. In a demonstration, a Dell notebook seamlessly connected to a WiGig dongle attached to an HP NUC. The connection held while the executive walked the notebook walked the notebook about 40 feet away. When he returned, the notebook seamlessly reconnected. 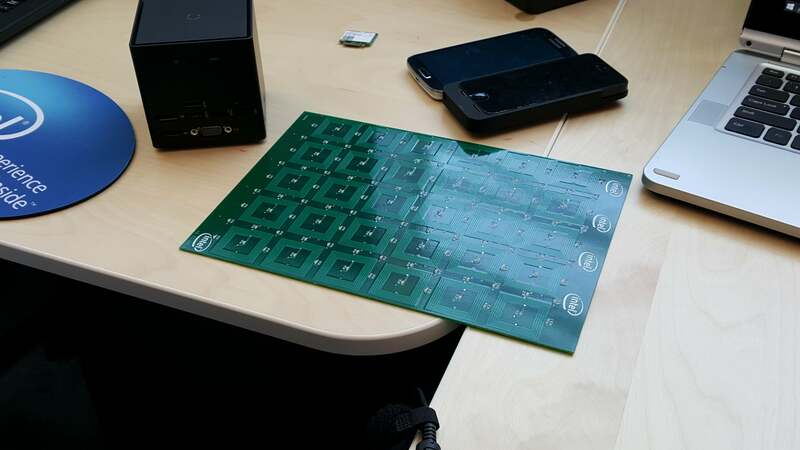 What do the guts of a Rezence wireless charging pad look like? Well, this. Unlike Qi, Intel says that a Rezence pad can be mounted underneath a desk, transmitting power through an inch or two of wood. While you don’t have to align a notebook perfectly to charge it, you do have to get it pretty close, at least according to the demo I saw. 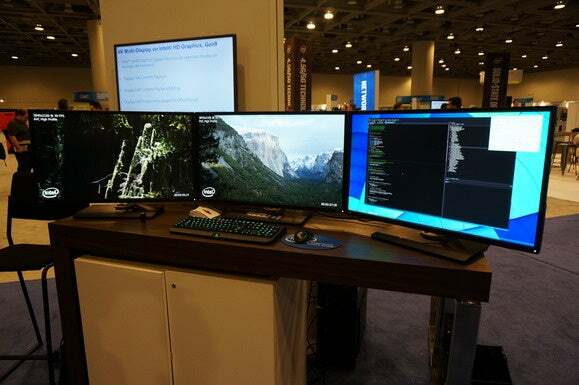 Not to be outdone, Intel also had a Wireless Display (WiDi) exhibit in its booth, with a tablet running a custom app that the company developed. 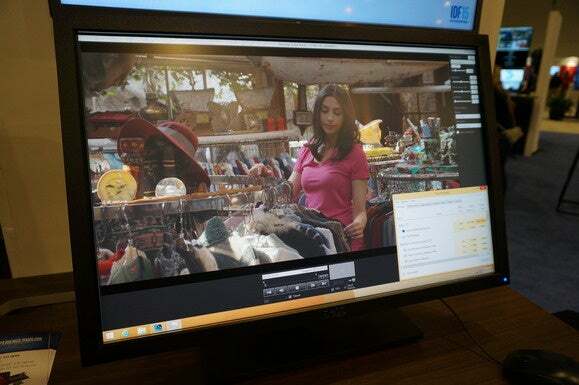 Next year, WiDi will support 4K via Miracast. The problem with WiDi has been latency—meaning that it works best with streaming video. It’s not perfect; there still were a few hiccups in places. But unlike past generations, the new WiDi technology compresses the video on the tablet, then sends it over the wireless link. The demonstration also took place on a show floor, which isn’t an ideal place to demonstrate new technology. 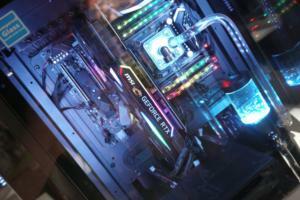 During Intel’s gaming PC session, the company presented a showcase of custom case designs, all housing a Skylake CPU inside. 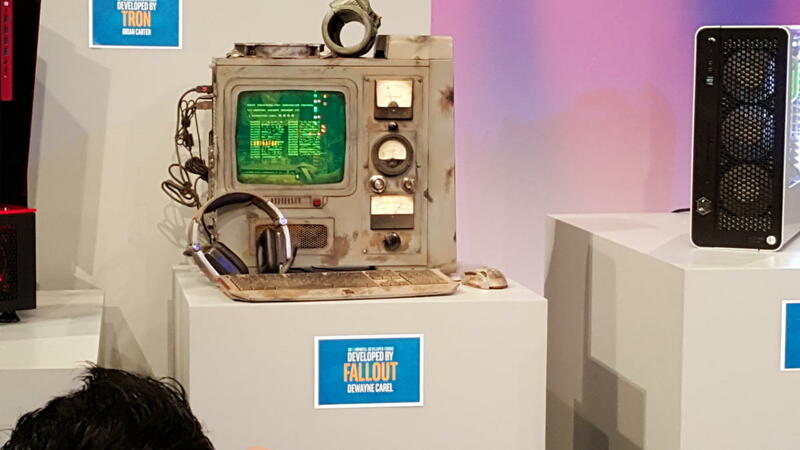 This Fallout-themed mod was one of our favorites. 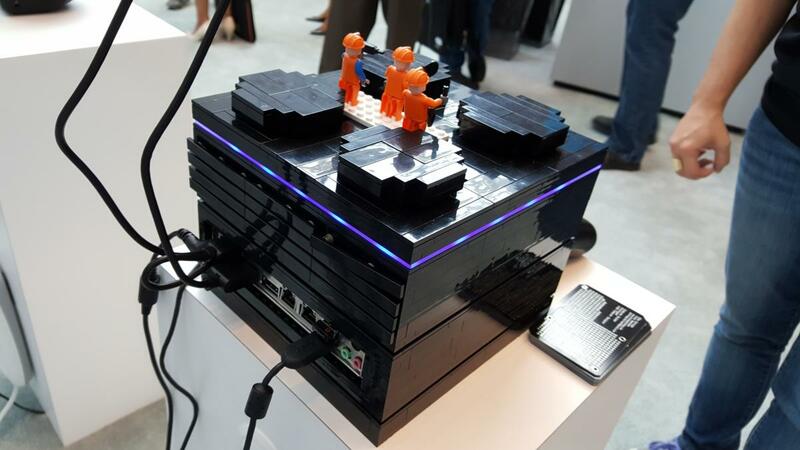 Computer builder Mike Schropp built this PC entirely out of Legos—not the only PC modder at IDF to attempt this, by the way. 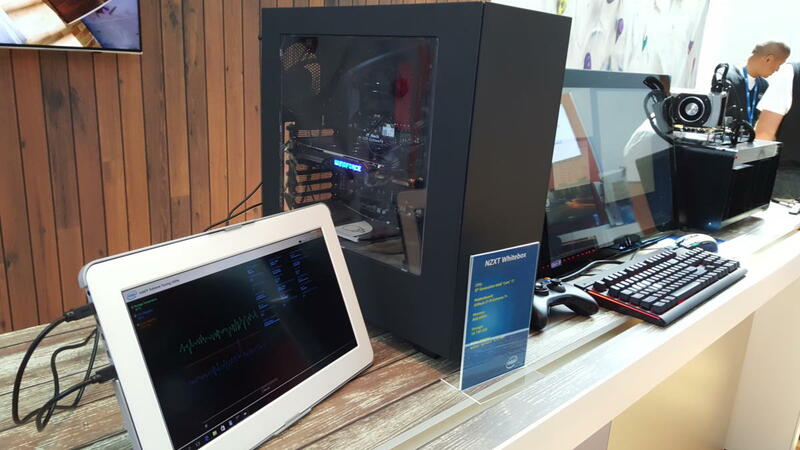 Intel had a collection of small, compact PCs in its booth, most using passive cooling in place of a fan. 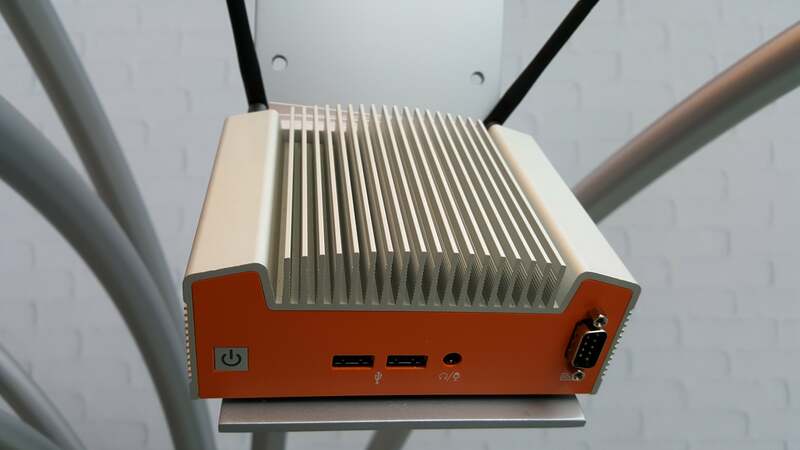 Note the massive antennas emerging from the back, to provide better wireless reception. 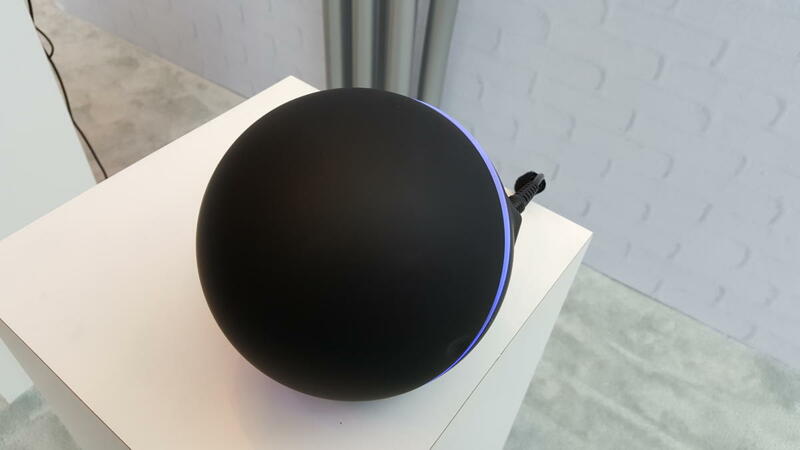 Is this the Google Nexus Q, back from the dead? Nope! 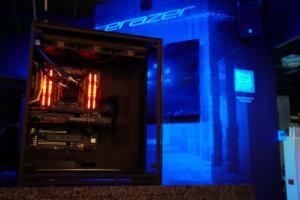 Just another compact PC. Who knew? If you visit the Food Network’s Web site, which has been optimized for the Intel RealSense camera, you can scroll hands-free without needing to touch the screen. That’s great when your hands are all gloppy after mashing avocados. 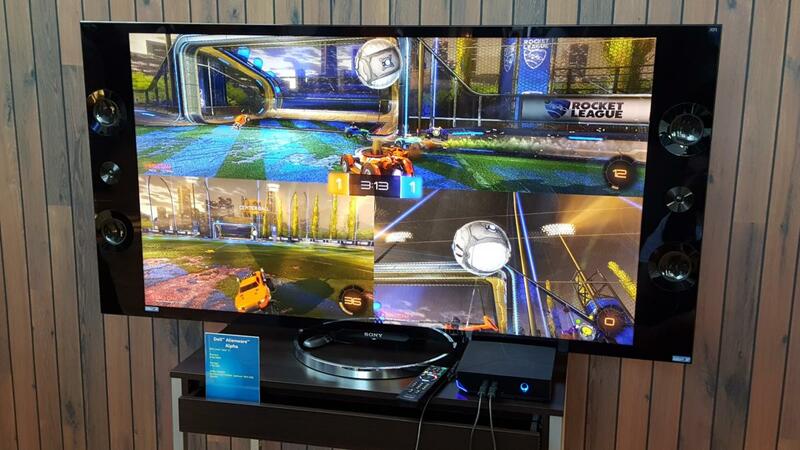 It wouldn’t be an Intel Developer Forum without a Core i7 Extreme Edition playing a 4K version of the indie hit, Rocket League. 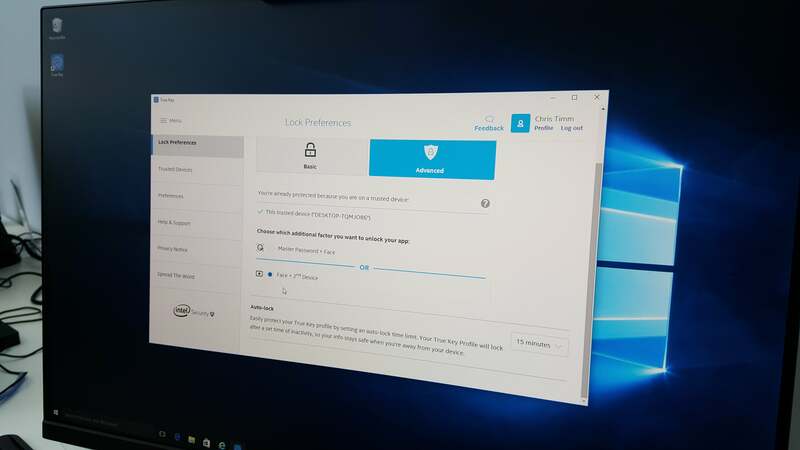 One of the benefits of buying a PC with an Intel RealSense camera installed (to enable Windows Hello) is that you can sign up for Intel True Key, a free service from Intel’s McAfee security division. Like Hello, True Key lets you unlock your PC using facial recognition. 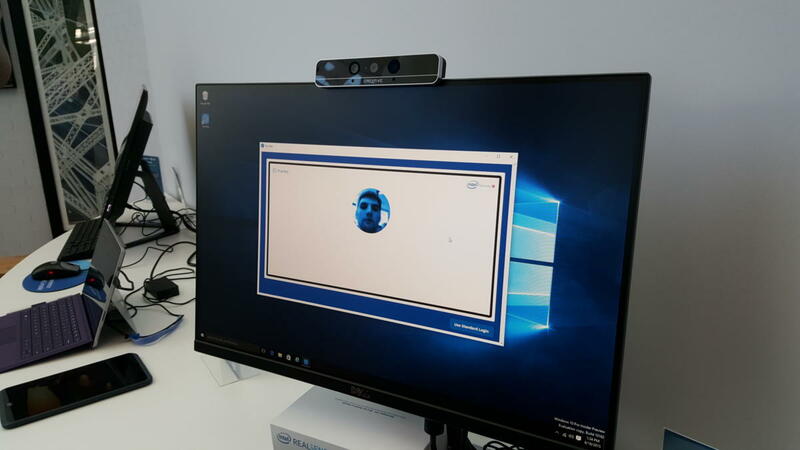 Both Windows Hello and True Key also use your face as your identification around the Web. But Hello’s related Passport technology doesn’t send a password to sites like Facebook; True Key does. Or, to be more specific, True Key uses a password generator to output a complex password to your bank or Web site, then sends it after your facial identification gives it the go-ahead. If you don’t regularly use the computer or tablet, True Key will ask you for a second form of authentication, sending you a code to your phone to serve as an additional means of security. For the first time, the Thunderbolt technology finally seems useful. 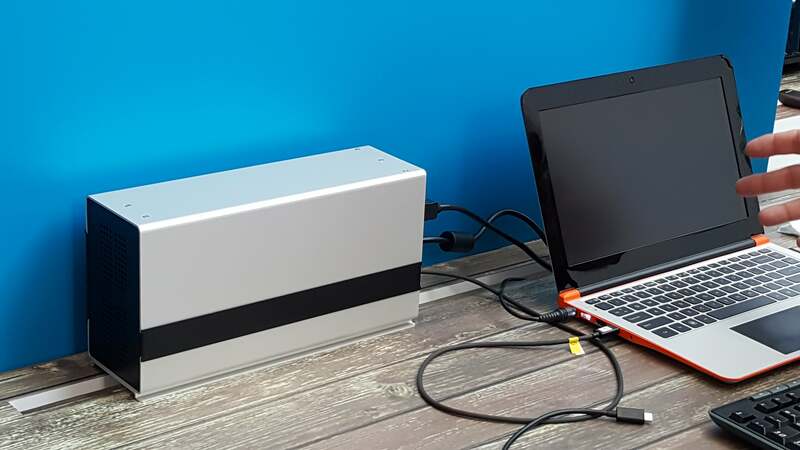 Not only does it run at a whopping 40Gbps, but it will share a connector with USB-C. Look for USB-C/Thunderbot to share connectors on more PCs going forward. 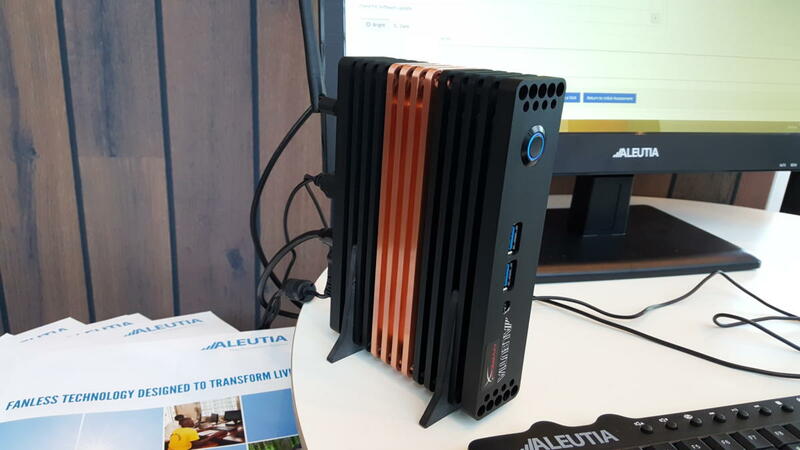 Aleutia manufactures fanless PCs, the latest of which is shown here. And yes, that copper-looking core is indeed copper, an excellent thermal conductor that, incidentally, is selling for its lowest price in ten years. 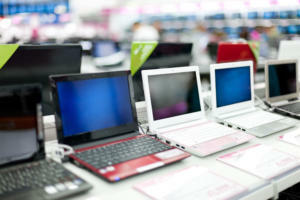 These fanless PCs are being sent to Africa, where they’re designed to serve as rugged low-cost PCs for the Third World. 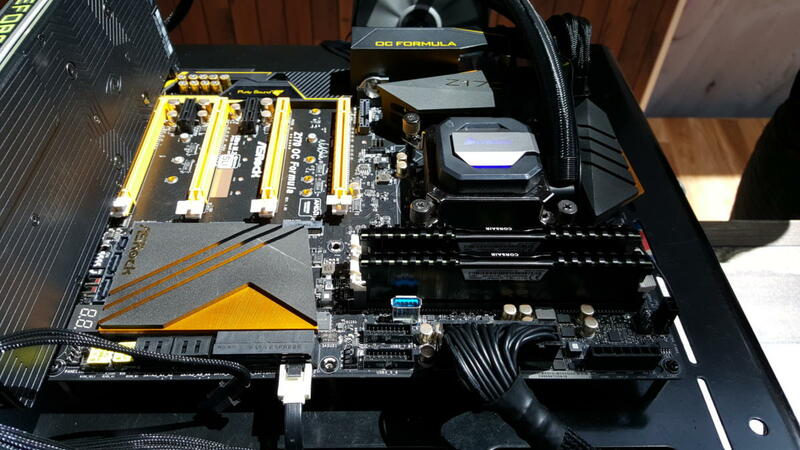 Intel also had a pair of desktop systems running Skylake, including this NZXT PC with 6th-generation Core i7 inside, on top of an ASRock Z170 Extreme 7+ motherboard. 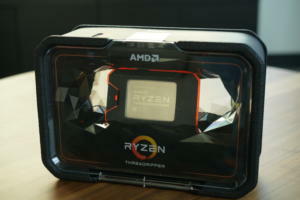 Right next to the tower was a similar Skylake system, but running the CPU-Z freeware utility, to show what was inside. 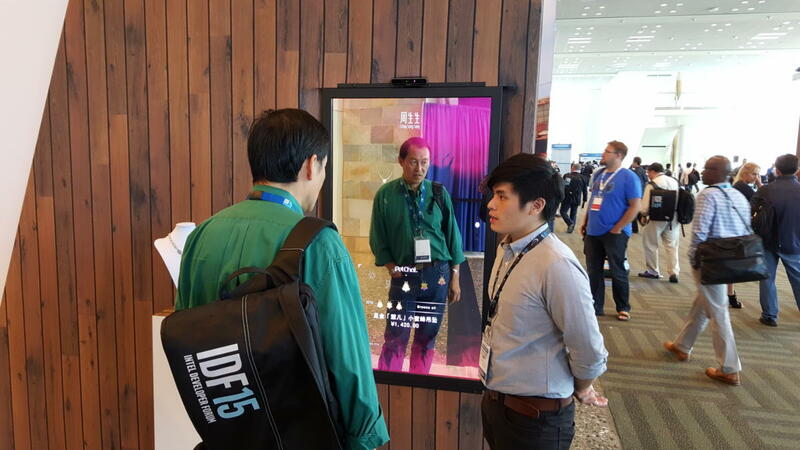 Intel had several exhibits showing off the power of its RealSense camera, including this “smart mirror” that projected an overlay over the image of the viewer. 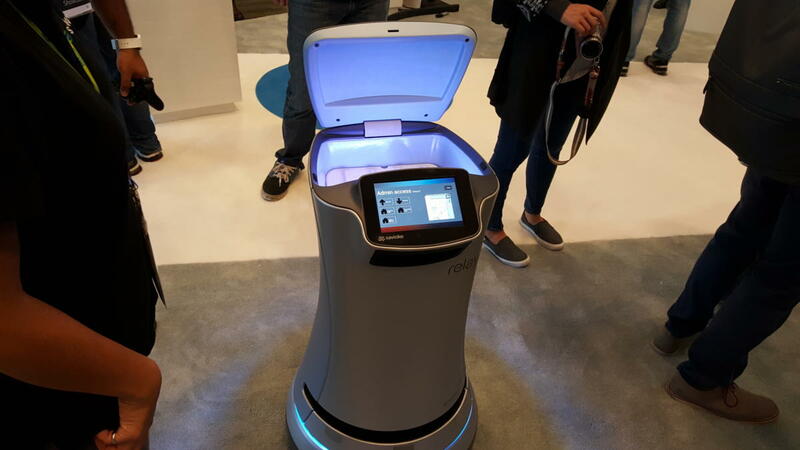 This robot from Savioke is designed to roam through a hotel or a conference center, dodging crowds in its quest to bring a user a cold drink, a toothbrush, or some other sundry object that it can put in its hopper. 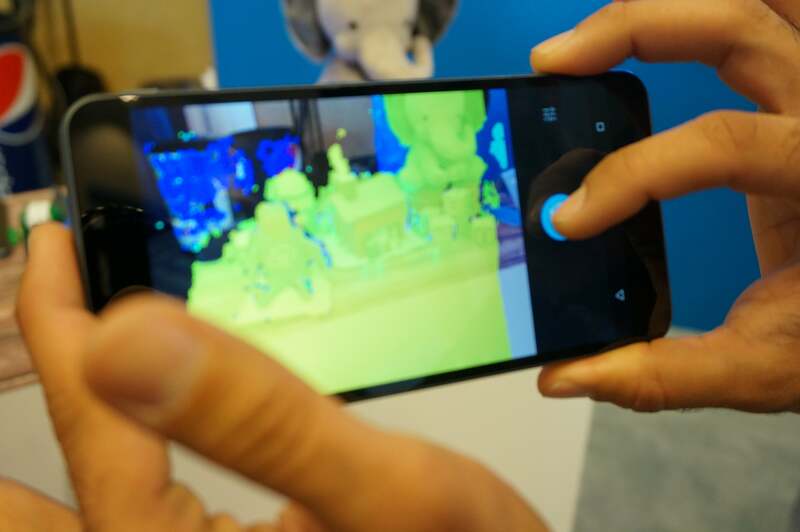 It uses the Intel RealSense camera to navigate. Because it makes sense to put a camera in an inflatable, fan-propelled shark. Naturally. 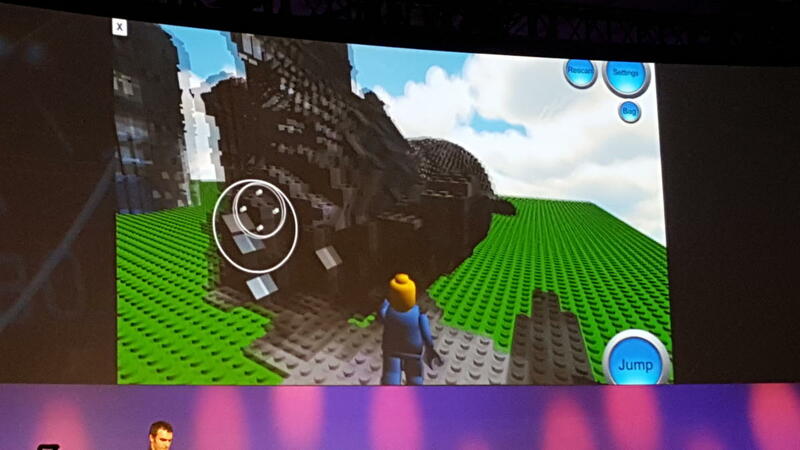 The Lego Future Lab showed off a cool prototype game where a user could scan in some household objects, then the software would “Lego-ify” them. A minifig could then roam around....this cat statue thing. No, there weren’t any chopping blades or flamethrowers. But if you wanted to try your hand at flipping a rival robot over, this was the place to come. In Intel’s world of the Internet of Things, an ecosystem of sensors connects to Intel’s Curie embedded processor. 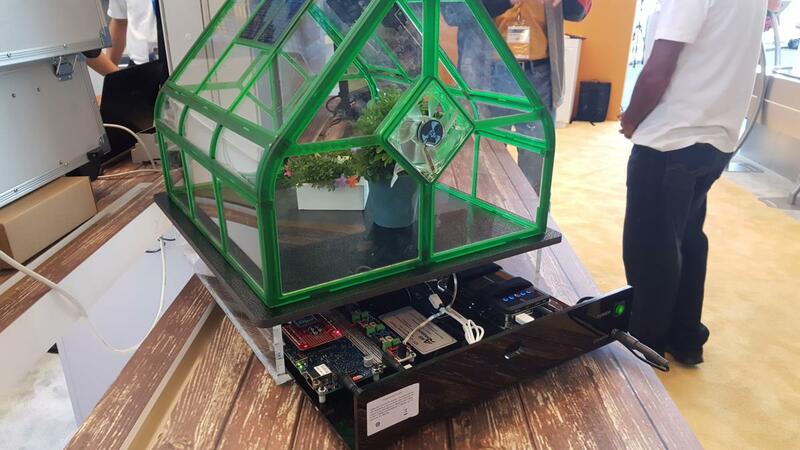 In this case, sensors inside the greenhouse help determine whether the fan needs to run to cool the interior. 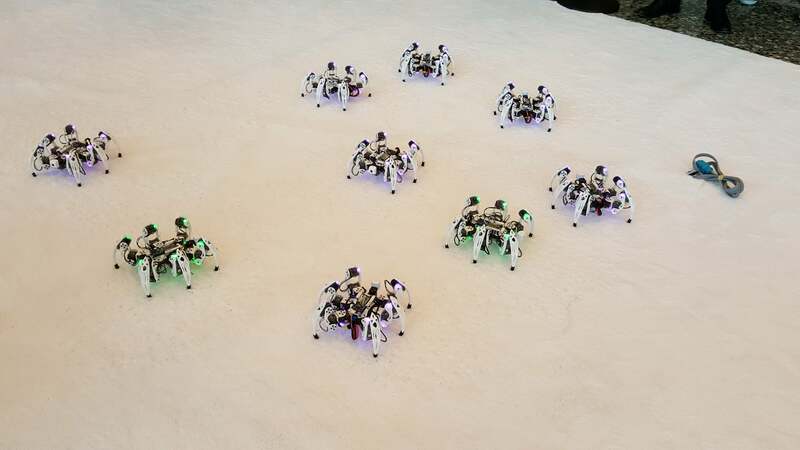 One of Brian Krzanich’s more esoteric powers is the ability to contol spiders—robot spiders, that is. During the keynote, he wore a special bracelet that the spiders were keyed to—when Krzanich lifted his arm, the spiders responded. These little guys were crawling around a special pen in the lobby. 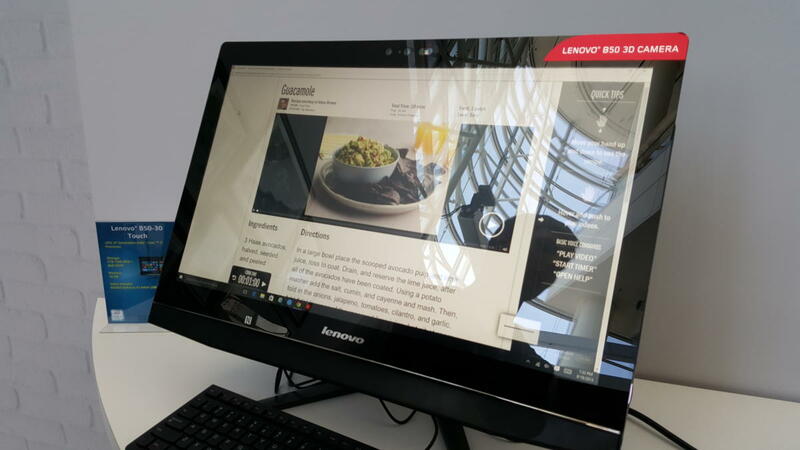 Intel’s new Skylake processor takes the multipanel display properties to new heights. 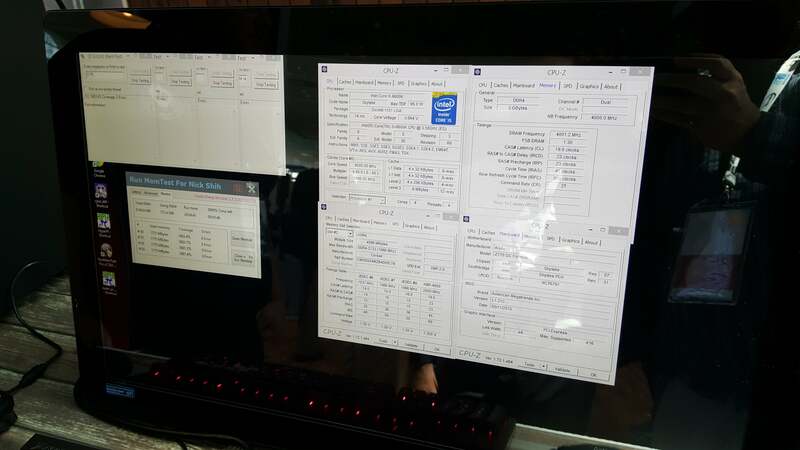 What you’re seeing here is three 4K displays running off a single Core i7-6700K chip. The two UHD 4K on the left are being off of DisplayPort 1.2 while the UDH 4K panel on the right is running on HDMI 1.4 at 30Hz. Skylake is capable of driving all three streams at 60Hz, but the motherboard the demo was running on didn’t have the ports to support it. And, no it’s not really technically 12K but that’s what everyone will call it. 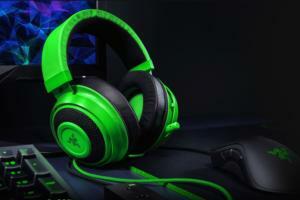 It’s true, it’ll soon be time to junk all those micro-USB cables. 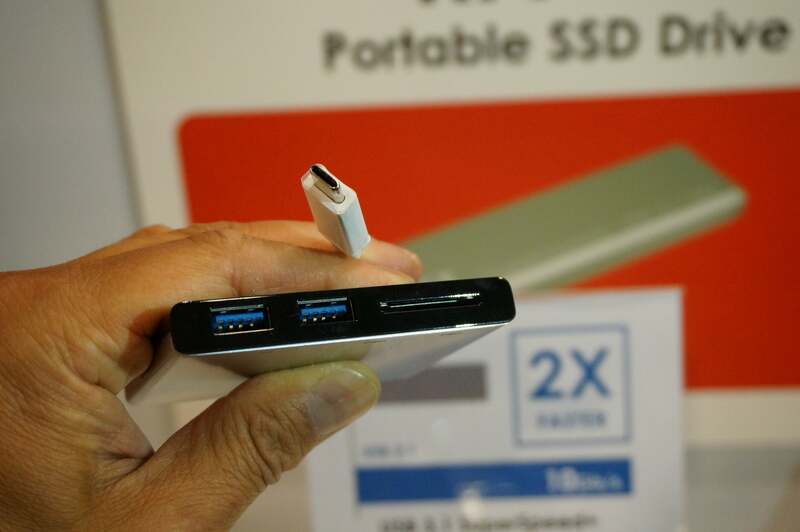 This nifty AFT card reader is USB-C based and has two USB 3 ports on front too. Skylake features fixed function 4K procesing support and in this demo, a Core i7-6700K is playing a 4K RAW video file from a Canon camera without dropping frames and with minimal CPU load. 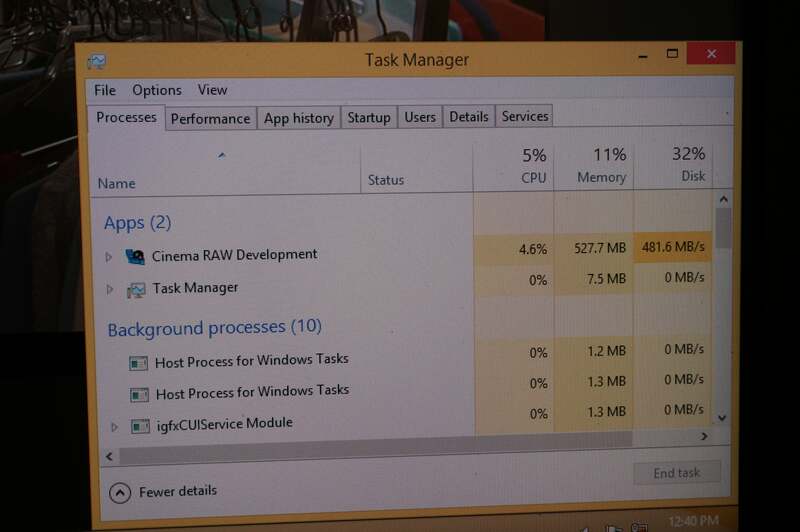 We shot the computer’s task manager as it played a 4K resolution RAW video on Intel’s new Skylake Core i7-6700K CPU. CPU utiliziation was usually 5 to 7 percent or lower. By comparison, a machine next to it playing the same video without using the new Skylake 4K fixed function units to help continually dropped frames, and used 70 to 80 percent of the CPU cycles just to play the file. Another interesting thing to note: This 4K RAW video file is pushing nearly 500MB/s off the SSD. That’s a lot of data being read. ...and here’s the finished product. 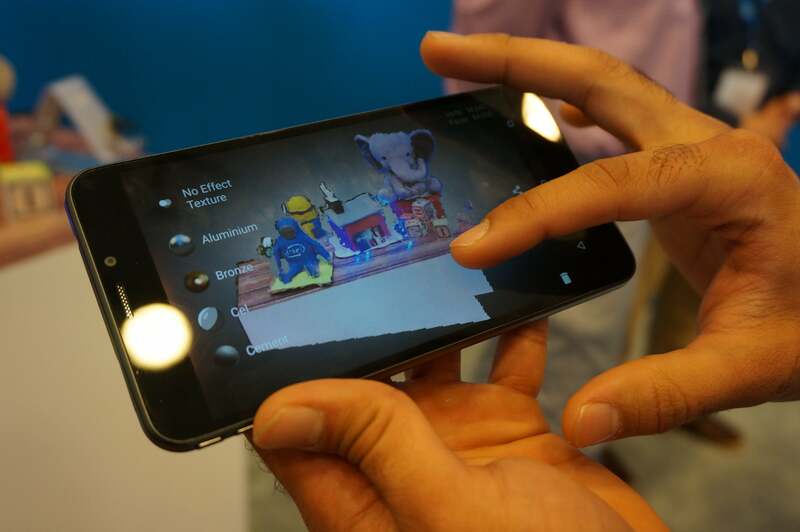 After moving the phone around the toys and scanning them with the RealSense camera, the phone was able to create a 3D scene that could be rotated and zoomed in and out. 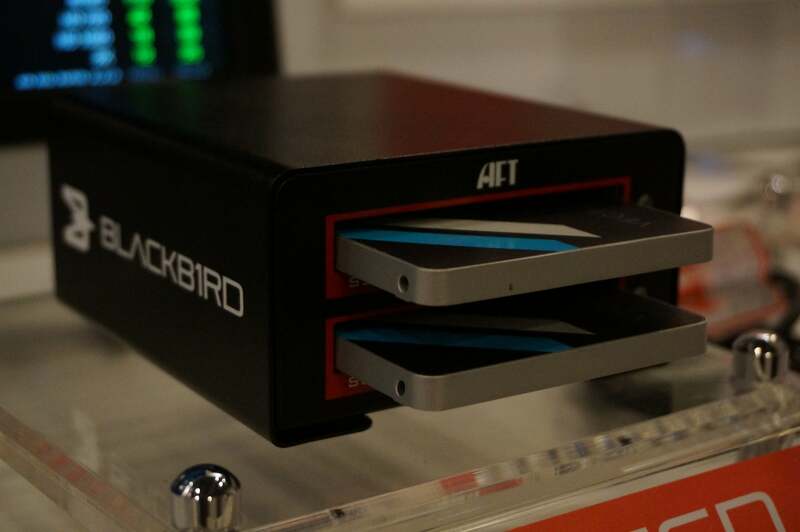 AFTech’s Blackb1rd lets you run two standard SATA drives in RAID over its USB 3.1 USB-C connection. By our estimates, that’ll use all of USB 3.1’s 10Gbps throughput if the controller in this cabinet and the motherboard can hit the full speed. In other words, we need more speed already. Thunderbolt 3, perhaps?